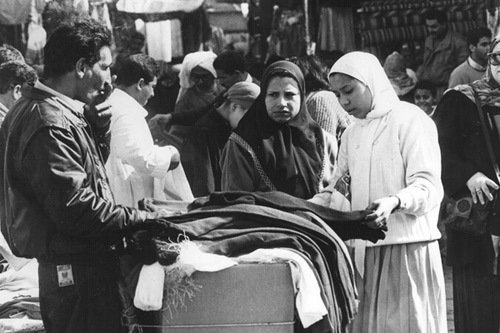 It is a late January afternoon and not a busy day at all at the Wekalet Al-Balah, Cairo’s most popular market for clothes and textiles. Only a few shoppers are wandering around the narrow alleyways of the market situated behind the otherwise fancy buildings of the Corniche Al-Nil on the other side of the Nile from Zamalek. The small adjacent stores are practically empty, and attempts by vendors to attract cautious shoppers into big bargains do not seem to be working. “It is not that I would not like to buy more; it is just that I don’t have the money to buy more. There are some good bargains, but I cannot get everything I would like to buy,” said Lamia, a 24-year-old civil servant shopping at the market. Lamia had been frequenting the Wekalet Al-Balah for over two years to buy her wedding trousseau. “This is not something that I will get done before another year. I mean to buy all the clothes, the lingerie, the bedspreads, the towels and the curtains here,” she said. Lamia’s visits to the market are on a monthly basis. “I get my salary. I pay the installments I have to pay for other items of the trousseau, which comes to about half. I keep what I need for monthly spending, and then I come to buy a few things here,” she said. She started her trousseau shopping a few weeks after the devaluation of the Egyptian pound in late 2016. Prior to that, she had already bought a few items, and she “can tell the huge differences in price” as a result. “But prices have been on the increase almost non-stop, even after the devaluation. At first [the merchants] said it was the devaluation, and then they said it was the expense of keeping the stores running because there had been rises in the cost of electricity, and then they said it was customs duties. The result is that there is always a reason why prices are getting higher and higher, and things are becoming more and more difficult as a result. This is already Cairo’s cheapest market, and I don’t know where else to go,” she said. Maged, the owner of a lingerie store where Lamia had just got a few items, did not contest his customer’s complaint about the prices. “I agree. But things are getting more expensive for us as well. We have stopped getting the things we used to bring in before because they have become so expensive for the vast majority of our clients. We are sticking to a medium range of items instead, and there are still complaints about prices,” he said. Maged mainly blames the devaluation and the “hugely increased customs duties” for the increases in prices. “The argument that the government is making is that it wishes to impose restrictions on imports to rationalise the use of foreign currency and to give a better chance for the sale of local products. But this is only theoretical — in fact, it does not make much sense,” he said. Maged’s imports have been from China and Turkey. “I don’t bring in many expensive items, so what I get is usually much cheaper than the made-in-Egypt items, which was also the case before the devaluation,” he said. He said that while his items had increased by something like 100 per cent in price, the prices in Downtown stores had doubled this. 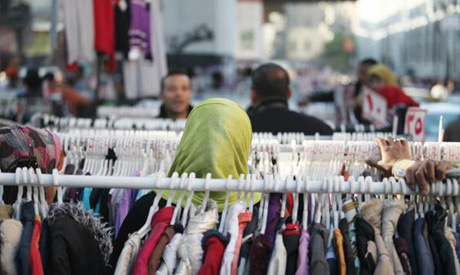 Yehia Zananiri, a member of the Chamber of Ready-to-Wear Clothes Vendors in Cairo, agreed. He said that overall the increase in the prices of clothes on the local market had been around 120 per cent, “maybe more because it varies depending on the imported inputs. Some items depend more on local products than others, but even in those cases there is the increase of the prices of energy which influences everything from manufacturing to distribution. Wages for some parts of the workforce have gone up as well,” he said. According to Zananiri, these increases are still much less compared to the increases in the prices of imported clothes that have gone up more than 150 per cent. During the past two years, Maged had stopped bringing in items from Turkey and had reduced the ceiling on the prices of the items he gets from China. For Lamia, this means a more restricted selection, along with higher prices, however. “This is about everything from lingerie to clothes to material for curtains and towels. Everything is a lot more expensive and considerably less appealing,” she said. Unlike Lamia, who is familiar with the market and knows her way around, Amina is a newcomer to the world of the Wekalet Al-Balah. For all her adult 30-plus years, Amina has been doing her shopping in Downtown stores. During the past two years, however, Amina has been increasingly challenged by the prices there, even during the sales. “The sales don’t really bring the prices down. I have cut down a lot on my shopping, but for my children I need to keep on buying things, not just to make them happy but also because their sizes change, and they need new clothes every year,” she said. Amina is the mother of two boys aged 14 and 16. “This is a challenging age. Boys need lots of clothes because they are often out. They need clothes for school and clothes to go out in. They need sleepwear and sports clothes and shoes. It is a huge expense,” she said. Also a civil servant, Amina was encouraged by Nagwa, a co-worker, to try her luck at the Wekalet Al-Balah. “It is frustrating, but I have to,” she said. “I suggested to the boys that they join me, but they declined, so I said I would go to look for things for them anyway,” she said. After a five-hour search, Amina managed to buy two pairs of jeans and a couple of sweaters and six pairs of socks. “These are the kind of items that would not look cheap. I mean jeans are jeans, and a pair of socks is a pair of socks,” she said. Fady, the owner of a denim store that has been operating in the market for over 10 years, says he is confident that the future of the Wekalet Al-Balah depends on denim and casual wear. “These are the kind of clothes where it would be hard for anyone to detect that a pair of jeans is expensive or cheap. I mean, for the most part a pair of jeans is a pair of jeans,” he said. Since he started his business over 10 years ago, Fady’s selection of jeans has undergone significant changes, however. Initially, he used to opt for Chinese denim and a smaller selection from India and the cheaper European countries. Then, after the economic changes that hit the country in late 2011, Fady restricted himself to the Chinese market, with “an extra small selection that I would get when I travelled for a limited clientele,” he said. “Then came the devaluation, and I limited myself to the lower end of the Chinese market, and by last year I depended almost entirely on the local market,” he added. He argued that the quality of the products in the local market is for the most part “alright. They are affordable anyway. People might complain about the finishing at times, and they have a point, but it is what you can get versus what you cannot get at the end of the day,” he said. Amina had paid a little under LE700 for her shopping. “I would have paid double the price or a little under if I had done the shopping Downtown. It makes a difference to me because everything is a lot more expensive, not just clothes. I still have to worry about food, transport, and so on,” she said. In November 2016, as part of the government’s commitments to the International Monetary Fund (IMF) to gain a grant worth $12 billion, a currency devaluation was imposed. This caused the highest-ever rise in the value of the dollar against the pound, with the dollar going from a little under LE7 to around double that price. Now the dollar is trading for around LE18. Last week, Central Bank of Egypt (CBE) Governor Tarek Amer suggested that another increase in the dollar exchange rate might be on the way sooner rather than later. One informed government source said that Egypt would have to “take its hands off the exchange rate sooner rather than later. This is part of the deal we have with the IMF to get the last tranche of the loan,” he said. “We have not been really interfering, but we have been taking measures to encourage the rate to stay low. We were hoping that we would not have to do this because we were expecting that the devaluation would bring about a surge in foreign direct investment (FDI), but this is still picking up,” he said. Egypt had been hoping to get the last $2 billion of the IMF loan by the end of last year or early this year. However, a source close to negotiations with the IMF said that there were “clear demands” that the government needed to acknowledge before it received the last tranche. These measures would open the door to yet another cut in subsidies on basic commodities, meaning that the prices of such commodities and services, whether provided by the public or private sector, would increase. Amina’s list of food shopping has lost several items as a result of the price increases. It has also undergone a significant decrease in quality. “There are things that we almost don’t buy anymore, and there are things that we buy much less of, fruit, for example,” she said. Amina’s medication has also been compressed. “I would not take the boys to a doctor for a cold or something like that. I might think about giving them an antibiotic without a prescription,” she said. Amina’s salary and that of her husband, also a civil servant, has seen a bit of an increase. “True, I have had a little under 10 per cent increase, and my husband had the same. But what does a 10 per cent increase mean in the face of a close to 100 per cent increase in the prices of food and of a similar increase in the prices of tuition, including school fees or books or private lessons,” she asked. While prior to the devaluation and the austerity measures imposed by the government she was able to allow LE600 to each of her sons three times a year, now she allows LE700 for both sons only twice a year. “We have to make ends meet. We cut one thing or another,” she said. According to Abdel-Hamid Mekkawi, an economics researcher at the Egyptian Initiative for Personal Rights, an NGO, there are no reliable statistics on the items that most Egyptian families who live on a limited monthly income have chosen to cut their spending on. However, he said that judging by the increases monitored by the CBE in the prices of clothes, it would be logical to conclude that clothes were one of the things that most families had had to economise on as they have been grappling with the new economic realities. “The fact is that the prices of basic commodities have increased, and at the same time the rate of growth in public services, including education and healthcare, two essentials for most families, have not reached the rate of overall growth,” Mekkawi said. He added that while overall growth was well over five per cent, the growth in services was less than five per cent. “This means that the cost of education and healthcare has increased. If anyone has a bit of extra money, and they have to choose whether to invest it in education, save it for a health emergency, or spend it on a nice jacket, they would probably exclude choice number three,” he said. According to traders at the Wekalet Al-Balah, such reworking of the clothing budget varies significantly from one family to the next, depending on the size of the family, the number of income-providing members, and the condition of the family as a whole. “If we are talking about a family with children in university, they have to invest a bit more in clothes than if the children are younger, and if the family has a member with monthly medical expenses to cover, then they would reduce their purchases, basic as they might be, or even stop shopping at all,” said Nabil, a textile merchant. Nabil has been in the business for three decades. During the last five years, he stopped trading in the textiles used to tailor evening gowns. “Before I would get a young woman buying material for her wedding dress and 10 friends buying material for the dresses they would wear for the wedding. Now more and more brides just rent a bridal dress and the friends just wear anything they might have,” Nabil said. Nabil had expanded his sales of material used for casual wear. “More and more people are opting for tailored clothes. I am talking about those who used to go shopping in the malls. Many can no longer afford the prices of these stores, so what they do is they pick up patterns from websites and get a tailor to make the clothes for them instead,” he said. Nabil said this trend had increased after the devaluation of the pound. He added that five tailors come to him on a regular basis to request material as a result. Rania is one who frequents the Wekalet Al-Balah to buy material to make clothes for an expanding clientele. “My clients include people who live in gated communities and people who work in banks and other places,” she said. When Rania started her business around ten years ago, she was essentially tailoring for women who were trying to get appealing clothes to meet their veiling requirements. Gradually, she got more clients who liked the quality of her products. However, during the past three years the range of clients has expanded as a result of the economic austerity measures. Rania is planning to expand her business because she thinks that with the tougher economic situation more and more people will not be able to afford the prices of the chains that expanded in Egypt from the late 1990s until 2011. She is also planning to go online. “I will continue to make made-to-measure items for my clients, but I guess I will also be making collection-standard items of smart causal wear and putting them for sale online. The material will be from Wekalet Al-Balah because it is much cheaper than from Downtown stores. Clearly, the cheaper the material, the less expensive the price tag,” she argued. This might not necessarily be an easy task, however, because according to some traders nice material has become too pricy for the purchasing power of many shoppers. Samir is one who is planning to clear the material for the clothes that he has and to move into furniture textiles. “The nice materials for skirts and dresses are not inexpensive. Their prices have also increased, and while there are more people who are opting for tailored clothes, there are also many who are moving into used clothes,” he said. Mohsen is one trader who has moved into the secondhand-clothes market. “Five years ago, it was clear that business was not going to pick up to the pre-2011 rates when things were relatively good. It seemed that a slowdown was coming, so I decided to start a parallel business in used clothes,” he said. 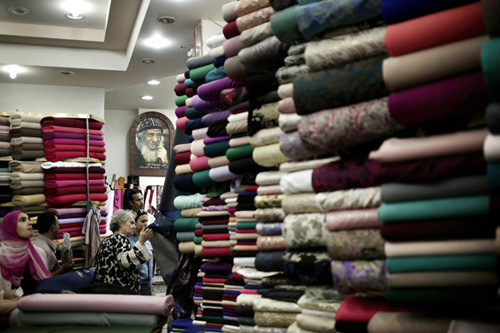 Mohsen’s trade in textiles was slowing down, and his secondhand-clothes sales were increasing. In a couple of years, he had fully switched into the used-clothes market as a result. Throughout the past three years, the business has taken a larger segment of his trading. “There have been new clients coming to the market who would not have shopped for secondhand clothes here before,” he said. Samia is a civil servant in her late twenties. For the last two years she has been one of Mohsen’s clients, and he provides her with clothes for her entire family. “In the beginning, I used to get myself and my husband a used jacket or something, and I bought new clothes for the children,” she said. She had not wanted her two girls, twins of eight years old, to wear old clothes. “But then I had to choose between feeding them well or getting them used clothes. I don’t tell them they have been previously used, as it would hurt them too much,” she said. Samia’s solace is that she is not the only one who has moved from new clothes to those that have been previously used. Friends and neighbours have done the same. “I know more people who go for used clothes,” she said. Mahmoud Askalani, president of the “Egyptians against High Prices” pressure group, said that there was a growing market for used clothes because it was becoming expensive for more and more people to buy new ones. “The traders and producers are not showing any sense of social responsibility. They want to keep their profit margins untouched, so they keep increasing prices to cover for increases in material and energy and so on. Even in the sales season the reductions are not large, so people have to go for previously used clothes,” Askalani said. 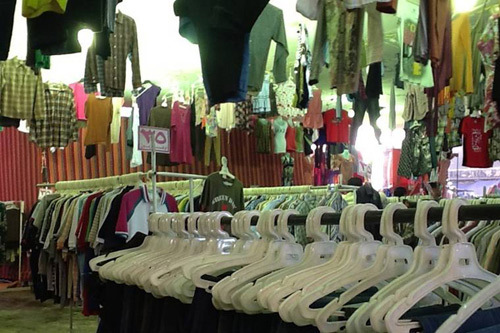 Zananiri agreed that there had been an expansion in the used-clothes segment of the market. It had moved during the past five years from less than 10 per cent to more than 15 per cent, he said. And there too economic hardship had forced a reduction of quality and an increase in prices. Mohamed, another secondhand clothes trader, said that during the past five years he had opted less for containers coming from richer European countries and more for those from poorer European countries and even from some Gulf states. “The prices of the containers have increased by around 50 per cent, and this has been reflected in price tags and eventually in sales. We have opted for less-expensive options as a result,” Mohamed said. “More and more, we see parents coming to do the shopping for their children without bringing the children along to avoid having to decline their demands. It is tough for parents to keep saying no to a child. Parents like to buy things for their children, but they cannot do as much as they would wish to,” he acknowledged. “There are people who used to be able to do their shopping from the used-clothes market in the Wekalet Al-Balah, and now they cannot even afford this. They depend on charity clothes that we collect and redistribute,” she said. “Luckily, there is a great sense of compassion, and people like to give, but the fact of the matter is that now more and more people tend to wear their clothes a lot more before giving them away as well,” she added. According to Askalani, the ordeal of the clothing budget for most families is not just a by-product of the government’s austerity measures, the devaluation of the pound included. “There is the privatisation that was introduced in the 1990s, whereby main public-sector stores were sold off. The impact of the privatisation of textile and ready-to-wear clothes’ producers was not very visible of course until the economic reform measures had reached the point of the past few years,” he said. He suggested that the government monitor the profit margin of producers and merchants. “Even in a free-market economy there needs to be rules,” he argued. Moreover, there needed to be “programmes for subsidised clothes. The government could produce or import simple, decent quality and inexpensive clothes and put them on sale in government stores,” he said. “I know that the authorities are embracing a larger role for the private sector and that the world is moving towards a free-market economy everywhere, but I also know that there is always a role for the government to make sure that people’s essential needs are covered, and these include basic clothing, especially in winter,” he added. Some traders at the Wekalet Al-Balah have an alternative idea for the government: to reduce the customs duties on items sold at popular markets. “The Wekalet Al-Balah is not the only popular market in town today. There are many around Cairo, as well as in Alexandria and other big cities. The government should support these markets and give them easier working regulations. They are the real alternative to the public-sector stores of previous times,” Mohamed argued.